There has been a name change. 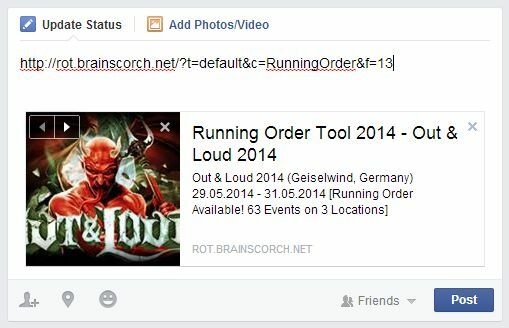 Running Order Tool 2014 is now Running Order Tool MMXIV. I chose to replace 2014 with its Roman literal equivalent, sine the number could be misinterpreted as the year of validity for this tool. There has been a bugfix. The bug caused some very short events to have very tiny fonts on the exported PDF. Despite some texts still slightly overlapping in very convoluted PDF files, everything should be sort of readable now. Note that the official running order does not contain all locations yet and is prone to changes. I will check it regularly and update it as it comes. Pay attention to the version number / last changes date of the running order in the upper left corner. Unless I am getting some requests (e.g. via the Contact form), this will probably - again - remain the only Running Order in 2016, since I am terribly busy. Sorry for that. Please note that there are some mistakes made by the festival organizers (e.g. wrong times and collisions). I will update the Running Order as soon as changes are published on the official website. Unless I am getting some requests (e.g. via the Contact form), this will probably remain the only Running Order in 2015. Sorry for that. I have updated some running orders of the next weeks festivals and added new ones that have been recently published. New experimental functions and running orders. I have added a new experimental functions. One of them shows the flag of the artists origin and the artists category or genre, if this information is available (I will continue to add categories and countries to artists, but you can also send me a message via the contact form, if something is particularly important to you). Additionally I have added a new button to the toolbar where you can show/hide the elements within the event boxes. It can be found in the toolbar in the running order view (lower left corner). Running order updates and a small change. I have updated some running orders of the next weeks festivals, up until Roskilde. Additionally there has been a small change with the event marking. Clicking on a event with a color, that already has this color, will remove it and use the default color. This should make it slightly more intuitive to mark and unmark events. Thanks to my brother for pointing this out (it has been in the old version like this, since there was only marked red or unmarked yellow). For the upcoming festivals this weekend or week, I have once again checked the running orders until 23.06.2014 for changes and corrected them accordingly. If you still find mistakes, please tell me via the Contact Form. Unfortunately Running Orders rarely stay the same after the first time they have been published. I am trying to keep track of changes as they appear, but sometimes I am missing some. If you find some inconsistencies, please let me know via the Contact Form. One big mistake has been made by me: The Running Order for Nova Rock 2014 in Austria was accidentally the Running Order from 2013. I corrected it by now. Further I have added missing festival images. Luckily some festivals provide high resolution logos. But some of them don't, then I had to get creative. Again, I have added a bunch of festivals, which I will check regularly for running orders. Take a look at the Festivals for the new ones. I have finished a preliminary contact form, which can be used to directly send me a message. Please use this if you have requests for festivals, features, or if you have found a mistake in a running order or the website itself. Or just use it to tell me what you think of this tool. Two running orders have been changed and/or contained some mistakes. In order to increase transparency, when the last change of an RO has occured, it is printed now in the lower right corner of the PDF file (Version number and date/time of the last change). I was preparing to add additional functionalities to the tools in the toolbar. Since the implementatinos might take a bit longer, I wanted to publish the preset colors for event highlighting as soon as possible. There are now 9 different color settings available just by one click on the colored boxes. Note that besides the color itself, also the opacity/transparency value might be different. In the future I want to add the last used colors, so if you use custom colors, they can be easily re-used. First of all, I have added two small things: A small yellow "NOW" marker in the upper left corner on festivals that are currently happening; and a new category for finished festivals, that happened in the past. Both can be found in the Festival Selection area. Also the first running order was updated. Hellfest 2014 in France changed it's running order, which affected 4 events. I have added five new running orders. Once again I have to say for the Running Order of Copenhell 2014 in Denmark, the duration/end times of concerts were not given by the festivals makers. For this reason I had to estimate the endings by the following concert, or just put 2 hours as a maximum concert duration. Additionally I have changed the default highlight color to red with 50% transparency, as it fits better than the gray color I only used during testing. In the next day(s) I will think about the handling of colors and introduce preset colors and options for the transition of colors for the PDF file. I am not exactly sure how I will handle these, there will be definately a printer friendly color set for the PDF (black & white or grayscale). The second small change is the newly added image box. It is shown in the running order view in the upper right corner and displays the festivals image. Now the personal running order sharing is more meaningful, since I have done a little bit of search engine optimization (SEO). If you share your personlized running order by copying the address into a social media website, which automatically adds a small description (e.g. Facebook or Google+) there will be now the festivals image (if available) and a brief description of the festivals running order avaibability (including number of events and locations), dates and where the festival is happening. I have added a three new running orders for two different festivals The reason for this: The Roskilde Festival (as mentioned below) has some kind of pre-festival, which they call "Apollo Countdown & Rising". This schedule starts 3 days before the main festival and only includes 2 stages. All three of these newly added running orders should be used with caution, because these festivals did not add any durations or end times for their concerts. Before I would have guessed the duration too short, I usually took the start time of the following concert, or just guessed it. Finally! The PDF Export feature has come! It is now in s beta state and can be used by clicking on the PDF button on the toolbar (in the Running Order View). Currently it supports PDF Export in Portrait and Landscape orientation. The colors of the Events will be taken as they are, including their opacity. Since the background color of the website is black, the colors will look different on the PDF with its white background. So, I'm afraid getting the best result might take some trial & error. The font color is currently fixed to black. So dark Event colors are not useful. They would take a lot of printer color anyway, so for now, this should be sufficient. The font size is calculated to make the text fit even into the event box of the shortest event of the whole festival. This does not take into account if this event is not even shown (e.g. when the location is hidden). This will be changed soon. The time scale is currently fixed in its length. For every day it will show the whole period of time to make the pages (for each day) look consistent. In the future I am thinking to offer an option to adjust the size for each day, depending on the visible locations/events. Be careful when re-arranging locations/stages. The order of the stages are separate for each day and will be shown the same way on the PDF. If you have "Stage A" on the first position on Day 1 and decided to push it on the second position for Day 2, you might risk some confusion. Today I finished the first part of the new toolbar, and yes, I know, it is a incredibly huge toolbar. I'm going to fix the size a bit later, since it requires some finetuning of all the depending elements. Jump to a certain Day. Choose a color for Event Highlighting. Right before this news entry I have been writing down most of the events of the Roskilde Festival in Denmark. Being one of the oldest Festivals (founded in 1971) it has a long tradition, unfortunately they appear to have no idea how to write a decent running order. They do not provide any durations or end times for their concerts, which makes it very difficult to make an accurate and useful personalized running order. In combination of the festivals size, adding the running order to this tool turns out to be a time consuming process. It will take a few more days to collect enough motivation to finish this. I have added a bunch of festivals, of which I plan to add running orders, as soon as they are published. Additionally, two running orders have already been added. Finally I can announce, that I have improved the event boxes in the running order view and also I have implemented two more features, which should work now as intended. Location re-arrangement by drag & drop. Link sharing by copy & paste the URL at any time. Next I will improve the toolbar, which will make it easier to choose the highlight color. Further I will add the location hiding feature. After these I will finally turn to the PDF export feature which will complete all the planned features of the first three milestones.